An investor can enter or exit anytime from the Smallcase without any fee apart from a one-time fee. When an investor buys a Smallcase from their website, the application connects to Zerodha trading account and places a market order for the pre-defined portfolio. An investor needs to apply an update to Smallcase every quarter. These updates are released by their internal team and you will get a mail to apply these the portfolio updates every quarter. All charges of buying or selling stocks such as STT, Exchange Transaction fee, CDSL/NSDL debit fee are payed by an investor. I have not mentioned brokerage as Zerodha does not charge for it. 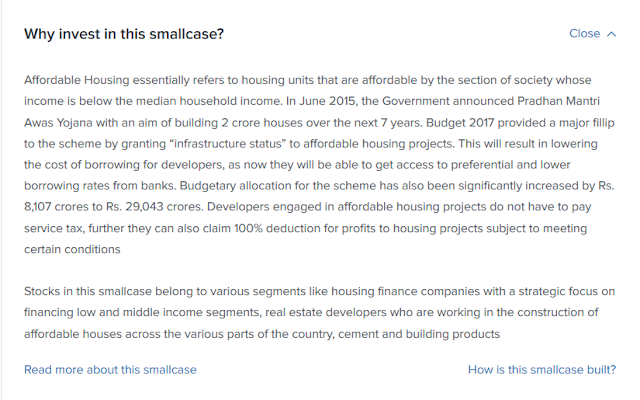 Zerodha offers 4 categories of Smallcases. Select Smallcase: These are made by cherry picking the best of the lot of other Smallcase. Thematic Smallcase: These are portfolios that reflect the current market theme like the sectors which will get benefited most in present time. Sector Smallcase: Portfolio based on sector-based exposure. As said earlier, one can select any type of Smallcases based on his understanding of the market and economy. Every portfolio is created by keeping some rational in mind. A prospective investor must go through the rational once. Each Smallcase is attached to their past performance but selecting them solely based on their past performance is not recommended. For example, Rational of affordable housing is given below. A beginner should go through thematic based Smallcase first. Consider going through popular ones and get an understanding of different flavours available. They charge a nominal fee of 100Rs if you purchase any Smallcase. Recently, They have released some new type of Smallcase which are charged 200 Rs. No additional fee for applying quarterly updated or when you add more investment to the same portfolio. How to exit from Smallcase? You can exit from any Smallcase very easily. You need to visit their website and click on exit Smallcase. It will place sell market order for all the stocks under it. Smallcase team has recently introduced partial exit in which, some of the predefined stock could be sold from the portfolio. An interesting thing to note is partial exit is not available for all the Smallcases. Once you exit completely from a Smallcase and if you are willing to invest again then you need to pay again their fee i.e. 100 Rs. You cannot invest in Smallcase unless you have a Zerodha trading and demat account. You can easily open a trading account with Zerodha and invest with ease. I have invested in affordable housing Smallcase on Feb 2017. My return on the invested amount is very good and is nearly five times of return offered by bank fixed deposits. One good thing about it is that I do not have to worry about my investments. I only have to apply release update which is offered by their team periodically i.e. every quarter. Here is the snapshot of my Smallcase investment. One advice for beginners is that do not buy a lot of Smallcases in order to diversify your portfolio. A Smallcase will have minimum 5 stock and max of 20 stocks. Selecting more than 4 will over-diversify your investments and decrease your investment returns. You should choose 1 or 2 Smallcase based on your market understanding and very portfolio has minimum investment amount. In every quarter when they release an update and if they remove any stock from that portfolio you have to pay CDSL/NSDL fee (around Rs 15) on every stock debit. How to invest in Smallcase? You can only invest in Smallcase via Zerodha trading application. So you should open an account with them before investing in Smallcase. Zerodha offers nil brokerage on delivery and max of 20 on trading in FnO. They can open an account within 24-36 hrs. Open your Zerodha account now.